Valerie, a founding member of the Guild of Scenic Artists, and Co-Owner of Infinite Scenic shares her tale of transforming a museum space into an intimate romantic dinner venue; and how one manages such a large and complex painting project. I want to share with you my process on an all-time favorite project. 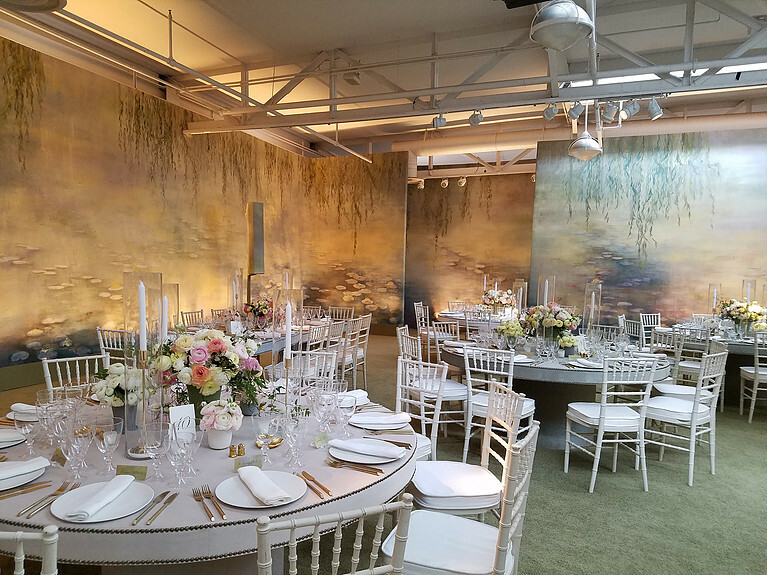 One of my most creative event planning clients requested Infinite to design and paint 370 linear feet of painted water lily wallpaper inspired by Monet’s iconic paintings. For this very special evening, he envisioned a total makeover of a huge room from a sunlit museum space, to an intimate and romantic dinner venue. Our paint work would be the key to the entire transformation. Sourcing enough fabric was our first big challenge. We needed more than 5000 square feet (enough to fill my whole shop and then some! ), all needing to come from the same loom source. 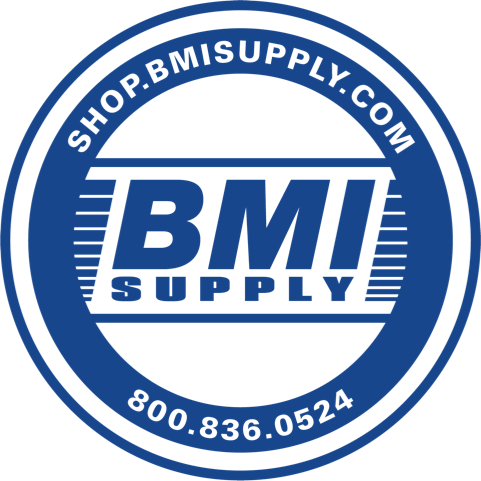 After comparing 8 quotes from 5 companies, Gerriet’s, a theatrical supply and fabric company was the winner! Their Cyclorama Eifel Fabric was the right choice for us, since the company was able to ship to us directly from their loom in Germany to meet the bulk order, and the heavy-textured weave of the fabric was a great cost-effective mimic for canvas. I invited some scenic artist friends to the Metropolitan Museum of Art, for a Saturday afternoon inspiration vacation. We got an up-close look at how Monet built up textures and shimmering layers of overlapping color to capture light both inside and out of the painting. I created a 3/16” scale layout drawing for my team to follow, and printed tons of research photos for reference. In samples, I developed a scenic shortcut to Monet’s textural buildups by layering pasty, scraped, dragged, and scumbled applications of Jaxsan and Sculpt or Coat over Gerriet’s heavy weave canvas fabric. We all know how physically exhausting heavy texture application processes can be, and over that much area I had to come up with solutions so my crew didn’t burn out their biceps by the end of the first day. Rope-wrapped rollers, comb-cut car squeegees, giant bristle brooms, and rows of screwed-together chip brushes made great variety and scale of marks, and my crew of 5 got through 5000 square feet of texturing in half a day! I try to make a policy of getting through the boring steps of a process as quickly as possible so we have extra time to focus on the pretty stuff. We tacked out a quick 4-ft mason’s string grid and chalked in a cartoon of a basic map of major transitions of color areas. One of my favorite parts of the whole process was the looks on the crew’s faces when I told them we’d be starting off the layering with an 11-color basecoat scumble! To make that giant basecoat scumble go quickly, and make sense to everyone, I assigned 2 colors to each scenic, and put 2-gallon buckets of each color on 4-wheel dollies so we never had to worry about chasing drips and bucket rings across that broad an area. Over the next 10 days, teams of 5-6 scenics and I built up layer after layer of scumbles, glazes, dry-brush passes, sprays, and fancy brush work over the Jaxan and Sculpt or Coat under layers. Here’s what it looks like at the midpoint of the base color buildup. At this stage, you’re mostly seeing block brush scumbles and P50 sprayer toning, over the textural surface buildup. After the toning was pretty well developed, we did a quick pass with foam stamps to lay in the denser patches of lily pads. We also used a foam roller cut in leaf shapes to map out areas of willow branches. These weren’t meant as final shapes, just a fast way to map out forms to build more brush work on top. Building up the brush work on the lily pad shapes, as well as surrounding light and shadow in the water, took a while. I think every project you’re really learning on goes through a few anxiety-inducing ugly duckling phases that make you question whether you have any business being in charge of a painting. Here’s our wallpaper, at one of those awkward growing pains phases where, the shapes were looking more like cobblestones in the mud, rather than lily pads in a pond. One aspect of this stage of the image development that was challenging for me as a manager, was that my crew didn’t need to work like a team anymore. All the major brute-force steps were done, and we became a bunch of separate of leaf specialists, lily flower experts, blending gurus, and highlight dabbers. Working from such a tiny rendering over such a large space, it was tough keeping everyone clear on how they could keep moving forward in a coordinated way while working on very different goals for the image. My secret weapon for this: Rainbow Road Cones! I can’t say how much I love these. As a relic of a past project, our shop has about a hundred 6-inch plastic road cones in 6 colors. I use them like a code for my crew to follow. Sometimes I assign one color per person, and ask them to do their step anywhere I’ve left their color cone. Or sometimes I use the cones more literally, by saying “add yellow highlights near where I’ve left yellow cones, and blue shadows near blue cones”. Also great for connect-the-dots steps. In the photo below, we’re getting ready to add longer willow branches that end wherever there’s a green cone, and add highlights and toning on yellow and blue cone areas. I spent a lot of time in the last few days of the project perched on top of ladders in the shop, to try to get a better idea of how colors would flow and repeat in the finished piece and in the corners of the rooms. Our whole team owes a debt of gratitude to Jess Goerold, who spent about 3 days straight painting only willow branch leaves, and Emily Baldasarra, whose brush work was key to getting our lily pads to sit just right on the surface of the water. After trimming, rolling, labeling, and wrapping all of the wall panels for shipment to the event space at Baltimore’s American Visionary Artists Museum, Ana Maria Aburto and I traveled down to help do touch-ups at the 3-day install. For our shop, it can be rare for us to see our finished work under final install conditions, so we felt lucky to get to see this thing through fully. The fantastic and friendly install team led by Wadson Miranda carefully worked out all the wrinkles on what was essentially a lumber-reinforced pipe and drape system with a ground row encircling the enormous room. Ana Maria and I helped razor cut and patch in areas to cut around ceiling beams and ducts, and feathered out any awkward corner seam color transitions. Carpet, tables, floral arrangements, and place settings went down in a flash on the third day, and the look was finished. This project from a year ago is one of my all-time favorites, though you can see much more of my recent work through ​www.infinitescenic.com​. Managing such a large and complex project can only be accomplished with great planning and an amazing team to help you along the way. I want to give a huge personal thanks to the talented and hardworking scenic artists whose brush work is featured here. Check out their portfolios! « Prev: Inlay Wood Floor – without the sawdust! This is INSANE. It’s so gorgeous – great great work!! Beautiful project! And I love that you got to paint it! So many projects are now just being printed.